The guys over at The Film Look have posted a lot of great videos in their time, filled with some really good advice and tips. And this one is no different. Here, they offer up 24 tips, tricks and hacks for you to use or think about in your next film project. And unlike many videos of this type, these are actually useful. We’ve shared plenty of filmmaking tips and tricks on DIYP. In this video, The Film Look brings you plenty of these in less than ten minutes. To be exact – you’ll learn as many as 100 useful tricks that will make your filmmaking process easier and help you get more organized. And of course, many of these are not just limited to filmmaking. So, photographers, make sure to check out this video, too. I mentioned in a post earlier today how valuable I’ve been finding monopods in my video work more often lately. They’re such a valuable, but often underrated tool on set. But the things monopods allow you to do aren’t just for video. Many techniques cross over into the world of stills photography, too. In this video, filmmaker Mason Mashtare shows us five great tips for using monopods during a shoot. It often takes only a bit of creativity and some household items to make something awesome for your photo or video work. After all, that’s what probably brought you to this blog in the first place, right? In this video, Kyle and Jamie of Field of View and Michael Lohrum of DIYCameraGuy team up to bring you 11 simple DIY tricks you can do to improve your photos and videos. You already have most of these items and home, and if you don’t: they’re cheap and easy to find. So, it’s practically effortless to pull these tricks off, yet you can achieve some pretty creative effects. Take a look. Procrastination, lack of focus, distractions, too much sleep… They’re not friends of a creative person, but each of us is facing them from time to time. They make you less productive and efficient, but there are ways to beat them and raise productivity. 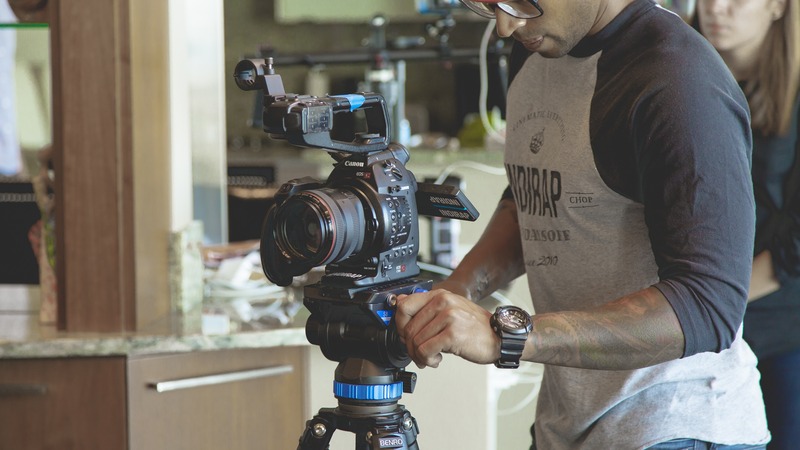 Jakob Owens of TheBuffNerds shares seven simple, but effective tips for all you filmmakers out there to help you become more productive and get to work. And although Jakob places a focus on filmmaking, photographers will find these tips useful, too. GorillaPod is a handy tool for photographers, and pretty popular among the vloggers. But, you can use it in many different ways when shooting video. It can help you mock a slider, a camera rig and even a drone (sort of). Jordy Vandeput of Cinecom.net shares five tricks you can pull off using just the GorillaPod. Although they’re mainly aimed at filming, photographers can use some of them as well. Before Twitter killed Vine, Kevin Parry was famous for his mind-bending short clips. The US-based stop-motion animator creates videos with clever and fun optical illusions. Even though we all know they are just clever filmmaking and editing tricks, for some of them we can’t help but wonder – how did he do it? We are DIYPhotography, but we love DIY solutions for moviemaking equally. After all, many of them can be applied to photography as well. Ryan Connolly from Film Riot gives you a list of top five (plus a bonus) DIY solutions for every filmmaker. They are cheap and simple, but don’t let it fool you – they can up your filmmaking game pretty well. Filmmaking involves a whole lot of knowledge, and if you ask me – filmmakers also use some magic to achieve certain results. Sometimes they use special effects, but on a number of occasions clever filming and lighting are just enough. Ryan Connolly from Film Riot brings you five tricks every filmmaker should know. They are simple, yet very clever ways to achieve great results with minimal investment and post-production.